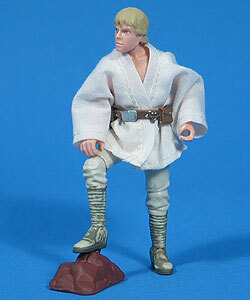 The ultimate version of Luke Skywalker, this figure perfectly captures every detail of the Farmboy from Tatooine. Pose him staring out into the distance, practicing his lightsaber techniques, or striking a pose shirtless, this figure can do it all! In honor of the Classic Trilogy release on DVD, this series of action figures includes reproductions of the vintage figures, including the same photos, graphics and even the Kenner logo. Compare this figure to the Vintage Luke Skywalker figure.